I started cutting my political teeth way back in 1968. 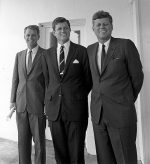 I remember the year because it was an event, a national tragedy that began the process: The assassination of Bobby Kennedy (d. 6.6.68), younger brother and AG of slain President John Kennedy (d. 11.22.63), who, after that dreadful day in Dallas, would go on to become Senator from New York and then Democratic presidential candidate, at a rally in the Ambassador Hotel, Los Angeles. As for the turbulent Democratic convention about ten miles south, a ruckus that started in the streets and probably sealed the win for Nixon, I didn’t have a clue. Tooth enamel’s tough stuff. It’s funny how a single event or piece of political paraphernalia, as ephemeral as it may be, can shape one’s life. I’ve had an interest in politics bordering on passion ever since. And, by jove, still have the mementos from that oh-so sad, significant day. When my baby teeth fell out, I started to cutting the permanents. I devoured my share of “heaping helping(s)” of empty TV calories for sure (Josie and the Pussycats, Gilligan’s Island, etc.) but ate up good servings of brain food in The Rocky and Bullwinkle Show, The Electric Company (1971), ABC Wide World of Sports and the evening news delivered by legends like Cronkite, Brinkley, Reasoner, Huntley, Walters and Chancellor. And it was Parker Brothers and their board-game Landslide (1971) that gave me hands-on experience with the electoral college and how presidential campaigns must roll their own dice in strategizing on the States. My teeth were sharpening, though, my friend Tom who owned the board game must’ve had a Trump skill-set because he out-tallied me every time. Gotta’ romance those swing States. But that passion turned downright frigid in lead-up to 2016’s election day. Not a big fan of Donald or Hillary, I will, nonetheless, honor the November 8th win, respect the authority of Office and hope for the best, in opposite of that .00003174% of Americans, including LeBron James, Gregg Popovich (“sick to my stomach”) & Steve Kerr who’ve chosen to ‘take their ball and run home’ because they didn‘t like the result. Best advice for the Neo-Visigoths: Find a copy of Edward Everett Hale’s ‘The Man Without a Country (1863)’ and read in deep. Clearly, the campaign to win and then keep basketball player’s “hearts and minds” is a never-ending effort for the NBA coach. So much for trust, eh? Ugh. And Hillary Clinton is no loser. Taking the popular vote is champion and aught win the White House in a democracy. But unlike Al Gore in 2000, whose loss of Florida’s electors constituted the biggest heist job in American history, with the DC Robes as accomplices after-the-fact (Bush v. Gore, 531 U.S. 98), Ms. Clinton never came close to taking the college kitty. In short, the lady blew her chance. But that doesn’t make her a mascot to suffer the mamarazzi. Reference to Margo Gerster who, with baby-on-back, cornered Hill on a nature walk two days after the draining election, thinking it proper to void Hillary’s (& Bill’s) privacy to solicit a Facebook moment (What’s HC gonna’ do, tell mom to take a hike? ), an image widely disseminated soon thereafter, finding CBS (“Hiker Crosses Paths”), CNN (Erin Burnett) and whomever else feeds the faux pas. Bad play, ladies. And where were the Secret Service? But I’m not surprised. At first blush the electoral college appears antiquated, anti-democracy and whenever it veers off from the popular vote, always ends in GOP hands. But a historical tidbit unbeknownst to Demigoths and the normally insightful Bill Maher, the EC is a test the Founders necessitated that a deserving candidate must pass, a test still relevant. The winner must possess the savvy, the wherewithal in mastering the map to sway voters State-by-State, and in the process acquiring a healthy respect for the union that is this United (50) States of America. Most Americans had high hopes when the first minority took up residence in the White House in 2009. Obama was short on experience, seemed, apart from the birth certificate confusion, almost too perfect for the post and resorted to his own form of flippancy when topics got hot, but his ready smile gave assurance and he seemed eager to take on the big challenges that awaited. Obama will be remembered for four actions: 1) Brokering the deal with America’s healthcare “monster(s)” to create Patient Protection and Affordable Care Act (NFIB (2012)), costing greedmeisters next to nothing yet heaping much of the tax burden upon the middle-class (contra-FDR); 2) advising on capture / execution of 9-11 designer, terrorist Osama bin Laden (2011); 3) taking sides in the Trayvon Martin – George Zimmerman incident (2013) (“Martin could’ve been me 35 years ago”) after attacker Martin died of a gunshot fired by block watch volunteer Zimmerman who claimed self-defense, was charged and then acquitted, and 4) picking his NCAA basketball tourney bracket selections come March Madness. Unfortunately, on the one issue that Obama was particularly well-suited to keep moving the nation forward, race-relations, he has instead presided over what can be called a period of race regression, a sorry state not seen since Reagan-Bush. As for Donald, he’s sharp as a tack, has energy and an undeniable charisma, a pride in his person and nation and a certain maverickness that McCain the Senator never displayed, a trait lacking in Presidents for quite a spell (LBJ). But his anti-choice stand feels political, must check his habit to flippancy (global warming) and his disdain for regulation (Dodd-Frank), market-place competition and American jobs (monopolist) bespeaks of a boyish greed potentially more disastrous economically than Ronald Reagan’s trickle-down goof. Most troubling is that neither candidate exhibited the foresight, honesty, courage to put the voters to a test in self-sacrifice (“ask what you can do for your country (JFK)”), a national unifier if there ever was one. No measurable progress happens without it. It’d be analogous to Roger Goodell having chutzpah to ditch pink-wear in favor of a field-friendly color for all cancer victims and research (dark green), to use his bully-pulpit to force NFLPA to institute serious PED-testing or to tell NFL fans and sport scribes who curry favor to stop the incessant whine on game officiating come each “Monday morning.” Ugh. So what does Trump-the-President mean for the NFL and its fandom? A President, no matter the political party, usually has little impact on League operations or policy. But if a particular Commander-in-Chief has a real interest in the gridiron game, any comments he makes will make news. And this president-elect might actually have an interest. President Obama put on a good show, giving warm congratulatory speeches in welcome to a steady stream of title teams that now visit the White House for one more pat-on-their-collective back. But while he’s a love for the links, Barack appears to have no interest in the combative sports (+b-ball). And though he lacks the competitive spirit that led the Kennedys to engage the pigskin for some lawn version touch-football, Don clearly has a curiosity for the National game. Which toggles four sport topics on Trump: 1) The future of White House pep-rallies now that monarchial King LeBron has given thumbs-down with Trump-soon in residence; 2) What NFL team does Donald Trump favor; 3) how happy is Redskins owner Dan Snyder today, and 4) will the President-elect and his immigration blueprint alter future NFL – Mexico game plans? Since the 1970s America’s seen a prodigious growth in sporting endeavors, champions of which nearly all seem to find their way to 1600 Pennsylvania Avenue. So was born a new tradition that’s become about as tired as the never-ending supply of Law & Order reruns, diverting CICs from pressing duties or the down-time that a President must take to keep sound in mind & body in the most stressful job on Earth. Time then the custom gave way to common sense and got terminated by the new Prez. As Trump doesn’t need another reason to tick-off female Dems in cancelling only the less-popular women’s visits, if it happens (sure), expect him to can the whole kit n’ kaboodle. Who’s Trump’s top NFL team? A New Yorker, he may be a Giants, Jets or Bills fan. If his ties to Bill Belichick and Tom Brady are sincere, it’s good chance he’s Foxborough friendly. Like Barack, he’s always working an angle so it’s hard to get a read. If it is the Pats, Don’s hitching his wagon to arguably the greatest pro football dynasty in history. In 2016, the Cowboys believe, Carroll’s crew never quits, Big Ben’s 5-star field general, John Harbaugh mastered the pros and Bruce Arians coaches the Cards, but it’s New England, with their rare loss (SEA 11.13), that remains Empire’s standard. To the Washington Redskins and their war-in-defense of their 82 yr. old moniker against a niche effort spearheaded by Oneida’s Ray Halbritter and taken up in 2012 by johnny-come-latelies in corporate kids-for-change, malleable media, Democrat elite, a smattering of celebs and the Washington Post whose polling reported “9 of 10” aboriginal Americans are not offended by the motif, a new President in Republicrat Trump will undoubtedly lead to a more sensible, honest directive given the Department of Commerce and its Patent & Trademark Office. Court cases are pending but it’s likely this and other PC-appeasing stands taken by Dems held some sway over mod-voters in swingers. It didn’t help, anyway. As for the impact the recent American election will have on the NFL – Mexico business relationship, NFL Commissioner Roger Goodell will publicly downplay its significance but if a border-wall does become reality (doubtful), it’s hard to imagine its continuation. It will be interesting to see if Texans v. Raiders MNF game will out-draw the last record-setting NFLM meet in 2005 between Arizona and San Francisco which drew 103,000+ at Estadio Azteca.